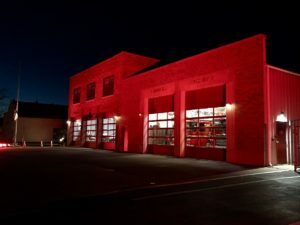 The main fire station in Clinton is being bathed in red light each night in honor of the firefighter who was killed in the line of duty last weekend. 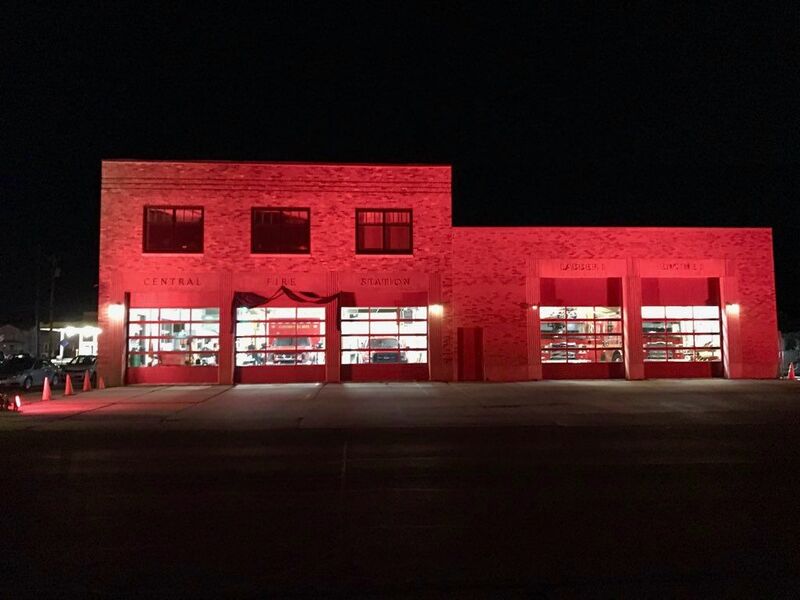 The crimson illumination is courtesy of Oskaloosa-based Musco Lighting, where vice president Jeff Rogers says a six-person crew set up and continues to maintain the display nightly. 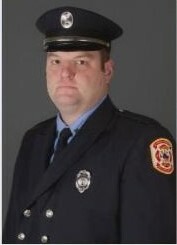 Last Saturday, 33-year-old Lieutenant Eric Hosette died in an explosion while fighting a fire at the ADM Grains plant in Clinton. Another firefighter was critically hurt. 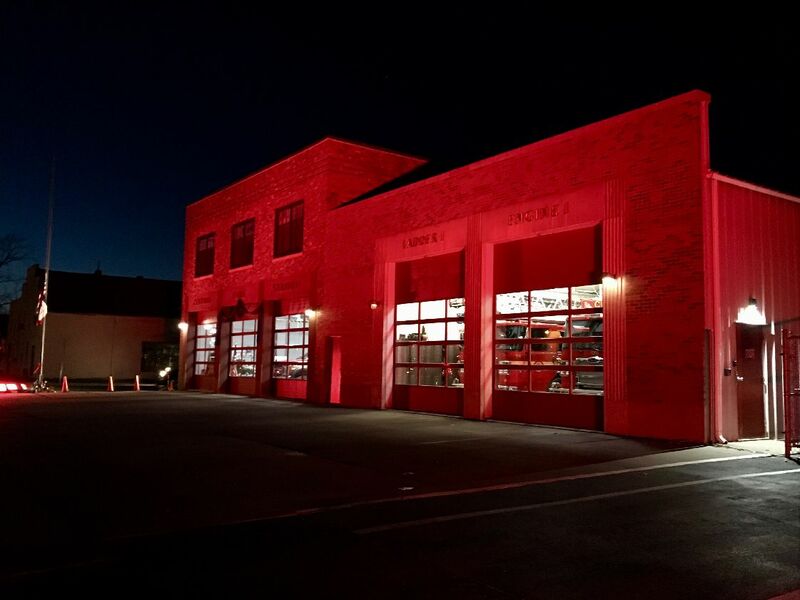 Rogers says painting the fire station in red light is a simple yet effective way to remind all passersby of the sacrifice brave men and women in uniform make daily. State flags across Iowa are at half-staff through Sunday in Hosette’s memory. A public visitation this afternoon and a public memorial ceremony on Saturday are expected to draw many thousands of mourners to Clinton from near and far. Rogers says the red lights will stay on nightly, likely through Monday. “Our team is very honored to be able to participate in a very sad situation but we feel good about our team members wanting to step up and honor Eric and what he stood for,” Rogers says. 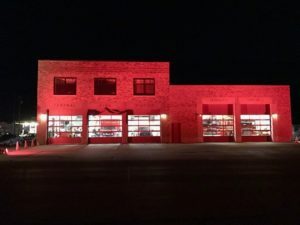 Many residents in Clinton and surrounding communities are displaying red lights on their homes to show support for the department and many stores in the eastern Iowa town have sold out of red light bulbs. The firefighter who was injured in the blast, 23-year-old Adam Cain, remains at University Hospitals in Iowa City in critical but stable condition. Hosette’s public visitation is scheduled from 2 to 8 PM today at Zion Lutheran Church in Clinton. Services for the community to honor Hosette will be held at 11:30 AM tomorrow at the bandshell in Riverview Park in Clinton. A private family burial service will be held in rural Charlotte after the service. Hosette leaves behind a wife and young daughter. He also served as the fire chief in the Charlotte Volunteer Fire Department. Donations can be made to the family through a fund established at Clinton National Bank.